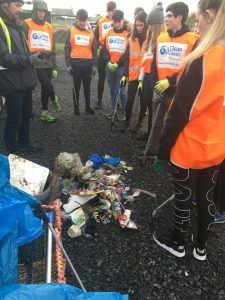 COMMUNITY INVOLVEMENT IS AN IMPORTANT PART OF TRANSITION YEAR. FOR THE STUDENTS WHO DO “GAISCE”, THE PRESIDENT’S AWARD, COMMUNITY INVOLVEMENT IS A REQUIREMENT. 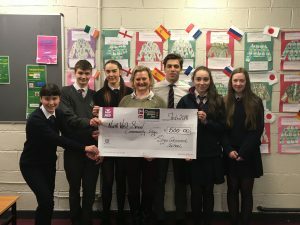 APART FROM THIS, HOWEVER, THE TRANSITION YEARS GET INVOLVED WITH DIFFERENT COMMUNITY GROUPS AND DO A LOT OF FUNDRAISING FOR LOCAL AND NATIONAL CHARITIES. 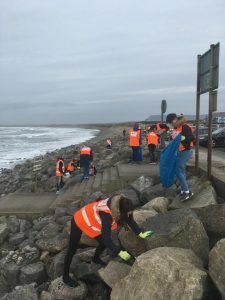 On Thursday 17th January, the TY Sustainable Living group spent the morning on Strandhill beach picking up litter as part of the Clean Coasts programme. This is a national drive operated by the Environmental Education Unit of An Taisce. It aims to get local communities involved in the protection of Ireland’s beaches, seas and marine life. 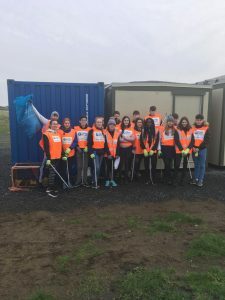 The local group organised a clean-up in Strandhill and our TY students eagerly volunteered their services! Seamus McGoldrick of Sligo Surf co-ordinated the clean-up and provided the necessary cleaning equipment. The students found that a lot of litter gets trapped in the crevices in and around the rocks on the beach and it is only when you get down onto the sand and look back towards the shore that it becomes very obvious. The students worked hard for a few hours, managing to gather a lot of rubbish. They even found a Fanta can from June 1994 – World Cup USA!! A special thanks to Mammy Johnstons who provided free ice-cream for the troops! 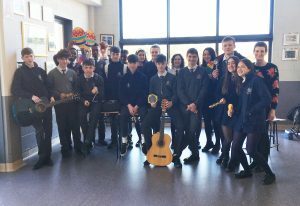 In Sligo Grammar School TY students are encouraged to get involved in the community in a variety of ways. 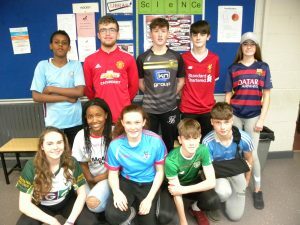 As well as volunteering to help with community projects, working with people with special needs and participating in flag days the students run special fundraising events within the school. 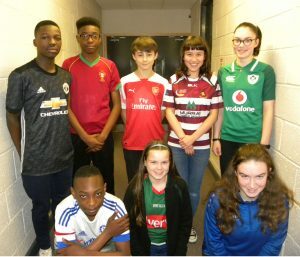 In 2018 TY students ran a “Jersey Day” in aid of the charity GOAL and teachers and students from all classes got involved, donating €2 each for the privilege of wearing the jersey of their favourite team. 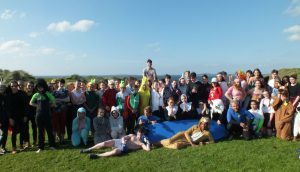 In November TY Annual Sponsored Swim took place. 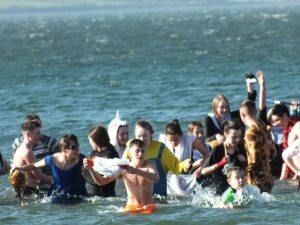 Seventy students participated in the swim at Rosses Point beach, some in fancy-dress. 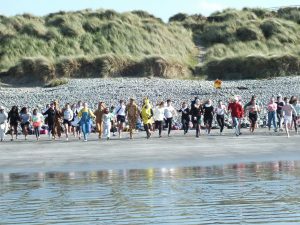 The swim was a huge success with €1,200 collected for various local charities. A special thanks to Paul (lifeguard) and all the teachers involved. A host of different projects are taken on during the year which encourage TY students to think about the world outside their own experience.Below are a few examples of TY in the community. 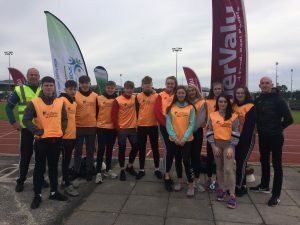 For the last number of years TY students volunteered to help with the Primary Schools Athletic Event in Sligo IT. They worked with all classes and learnt a lot about the skills needed to work with children. For many years TY students have worked with St Cecilia’s School which caters for children with moderate, severe and profound learning difficulties. 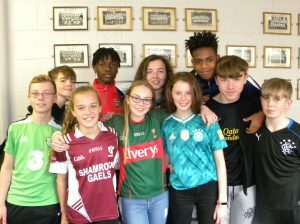 The students from St Cecilia’s come to the Grammar School and the TY students work with them, sharing activities and playing sports with them. The SGS students find the experience challenging but very rewarding. The TY students get involved in special and one-off projects with different groups around the town. TYs have worked with people from Liscarney House, which offers help to those with anxiety and depression. They also have been involved with Intergenerational projects working with the elderly.